Mahmoud Matter says that participating in demonstrations held by the workers’ syndicate in Gaza is his only hope to receive his wages. He has been employed by the Ministry of Health since 2010, but has not yet received a full wage. “I go early to my work every day, and do my best to efficiently do my duty and serve my people. But instead of being honored by receiving my salary, I am left to demonstrate and shout in order to get my right of a salary,” Matter said. He is one of tens of thousands of workers in Gaza who are offered only a small part of their salaries every fifty days or so. This has created a harsh reality for them and their families in a climate of deteriorating living conditions in the coastal enclave. “We are blackmailed in political splits, and left prone to extortion so that our leaders can achieve their narrow political interests,” he added. Gaza’s underpaid health, sanitation and public education workers declared a partial strike in an attempt to attract the attention of the unity government. They are calling on Rami Hamdallah, the appointed Prime Minister, to fulfill his earlier promises to settle the issue of Gaza’s workers, who had been financially neglected by the Palestinian Authority. All demonstrations held by the workers have been directed toward the headquarters of the unity government, based in northern Gaza City. Dozens of unpaid workers took to the streets in the protests, chanting slogans to demand equity and transparency. They demanded their right to work insurance, which they argue should remain preserved regardless of political instability instead of being used as a tool within the government’s internal issues. 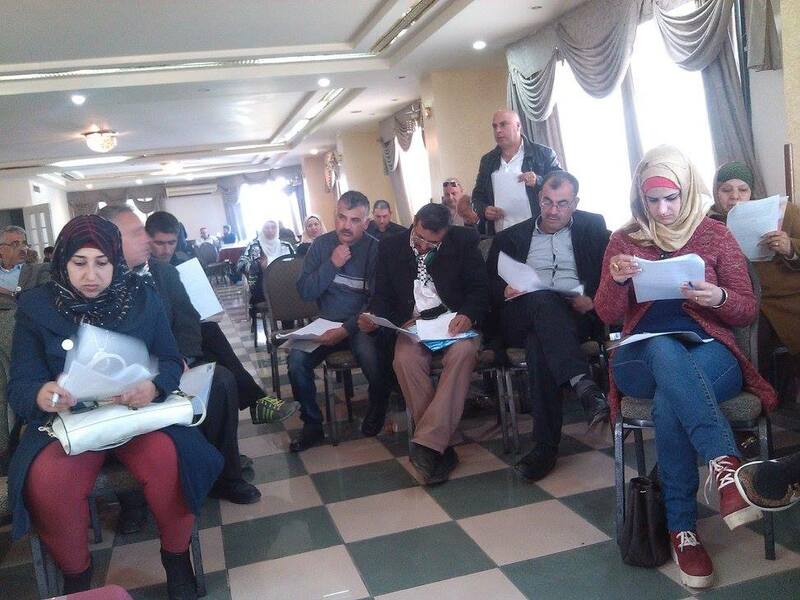 Mohammed Siam, head of the workers’ syndicate, holds the government in Ramallah fully accountable, since it refuses to recognize the workers’ rights to be paid from the PA budget. 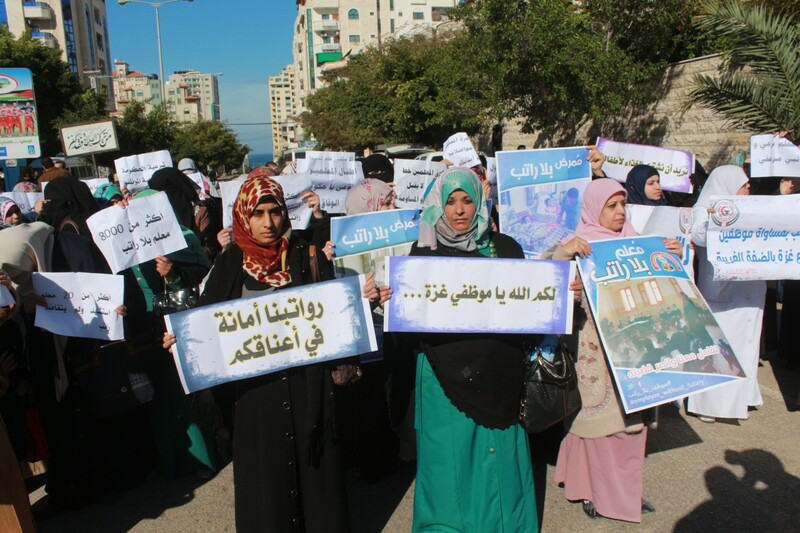 “It is totally unacceptable for the government to go on with this policy of denial toward Gaza’s employees. It is ultimately their right to receive their funds in a regular pattern,” Siam said. In Gaza, there are about 45,000 workers functioning as the breadwinners for more than 250,000 people, according to the syndicate. Teachers in the West Bank held a high-profile month-long strike of their own strike to demand full payments from the government. One excuse that the government in Ramallah gives for its failure to pay teachers is that the Palestinian Authority needs to adjust its budget in order to combat the impact from the massive Israeli attacks waged on Gaza and to expedite reconstruction efforts there. This excuse was particularly shocking for people in Gaza, whose expectations of the government were severely defeated after the last war, in 2014. 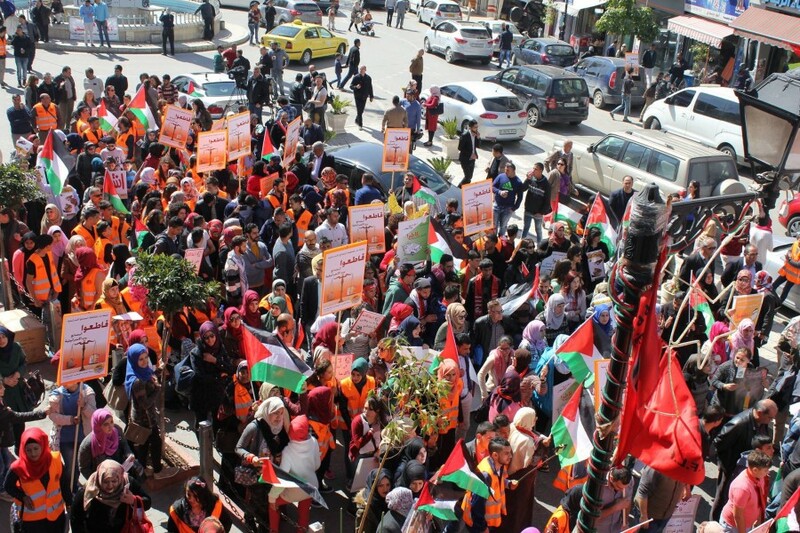 Many people in Gaza accuse the government of neglecting Gaza. But the workers’ syndicate goes further: “The government and President Mahmoud Abbas conspire against Gaza and its people. They not only abstain from helping us, but they incur more troubles when they fail to pay the workers,” Siam added. The syndicate said that the government now owes the workers millions of dollars. The unity government has only paid Gaza’s workers once since its formation in June of 2014. The government paid each of 24,000 workers $1,200 in October of 2014. However, payment was withheld from the remaining workers – those who were employed by the Interior Ministry rather than the unity government – despite that the State of Qatar has donated funds in order to pay them. Saher is not interested in government talks about Palestinian reconciliation if they will not bring an end to the workers’ crisis. “Our rights should be seen as a red line, if they still have a living conscience,” she said. 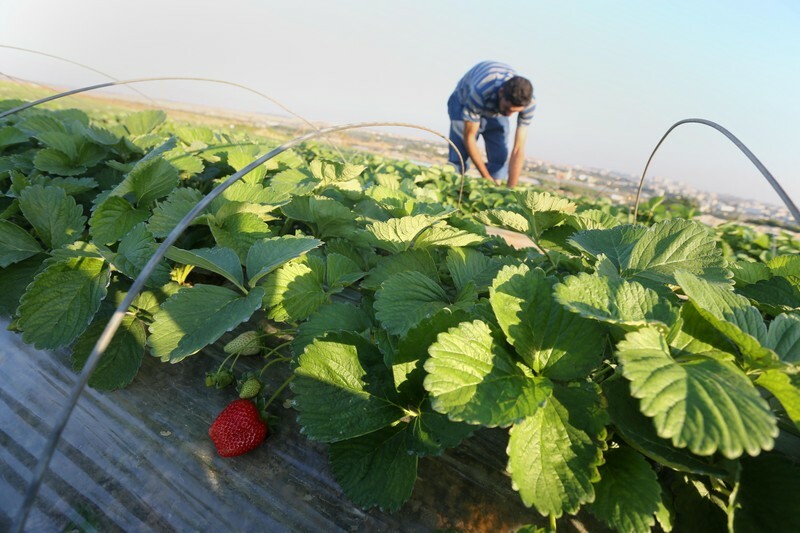 The intractable issue bears many repercussions because it began in 2007, when Hamas employed thousands of new workers to replace those who were refusing to work under the new government. At the time, these workers were urged by the PA not to work if they wanted to receive their usual salaries. Due to disagreements over the Syrian crisis, Hamas then severed ties with Iran, which had previously been a main ally of the Islamic organization. The Palestinian government’s financial resources and revenue were exhausted as a result. Click on the link below to read the full text of the resolution that has been presented by the Palestine Solidarity Caucus and placed on the agenda by the Steering Committee. A referendum vote on this resolution will be held during the upcoming elections. Resolution: Standing in Solidarity with Palestinian civil society and joining the Boycott, Divestment and Santions (BDS) Movement. Should GEO/UAW2322 and its members join the global movement for Boycott, Divestment, and Sanctions, until such time as Israel has complied with international law and respected the rights of Palestinians in the West Bank and Gaza Strip, Palestinian citizens of Israel, and all Palestinian refugees and exiles? 3. Promoting and protecting the rights of Palestinian refugees to return to their homes and properties as stipulated in UN resolution 194. This renews and furthers the commitment of GEO, whose membership overwhelmingly voted, in 2003, for divestment from the Israeli occupation. 1) GEO/UAW2322 should call on the University of Massachusetts (UMass) and the UAW International to divest their investments, including pension funds, from Israeli state institutions and international companies complicit in severe and ongoing human rights violations as part of the Israeli oppression of the Palestinian people. GEO/UAW2322 should also call on UMass and the UAW International to decline to conduct business with said companies. 2) GEO/UAW2322 should join other labor, academic and cultural organizations in calling on the government of the United States of America to end military aid to Israel. 3) GEO/UAW2322 should call on affiliated bodies such as UAW Local 2322, the Coalition of Graduate Employee Organizations, The UAW international, Jobs with Justice, Massachusetts AFL­CIO to join the BDS movement. In carrying out the activities set forth above and in acting on this proposal, we affirm that this proposal should not be interpreted or applied to seek to influence the hiring or other employment decisions of the University or individual academics or GEO/UAW2322 members; nor will it in any way limit or affect the representative functions of the Union including but not limited to which grievances or contract demands we pursue. Furthermore, this resolution does not seek to discourage association with individual Israeli scholars. GEO/UAW2322 is strictly committed to opposing all forms of discrimination including discrimination based on race, religion, national origin or ethnicity, and we affirm our strong commitment to the principles of academic freedom for all in the UMass community. 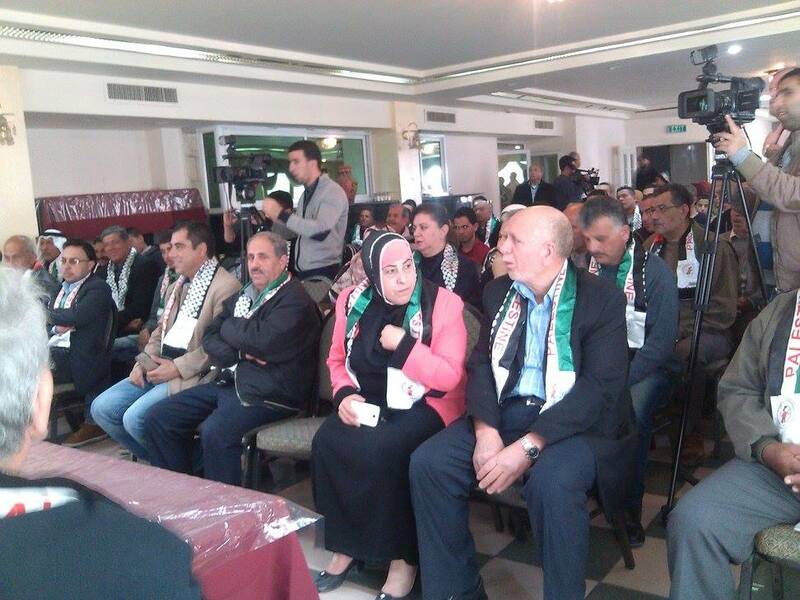 Saturday, March 26, the Palestine New Federation of Trade Unions (New Unions) have celebrated their official recognition as trade union federation by the Palestinian authorities and at the same time have held their annual congress, voting for a new union council and executive committee. The New Unions unite today 26 trade unions in all of the 10 West Bank districts and represent around 10 000 workers from all sectors. The event was packed and representatives from a large spectrum of political and social forces addressed the New Unions with their messages of support. Everybody stressed the hope that the New Unions will bring new force to the class struggle in Palestine and strengthen the national struggle for self-determination. Muhammad Jawabreh, a long standing unionist and one of the co-founders of the New Unions, gave the opening remarks of the congress and declared the birth of this new progressive trade union, which works to achieve the right to a free life with dignity for all workers and keeps committed to the legacy of the Palestinian national and class struggle for justice, democracy and freedom. Nasser Qatami, deputy minister of labour, congratulated the New Union for the official recognition as a trade union confederation and expressed the readiness of the ministry to cooperate and facilitate the work of the union in order for them to achieve the goals they have been established for. Bassam al Salhi, secretary general of the Palestinian People’s Party, encouraged all to support the New Unions and to strengthen their role in defending the interest of the workers and improving their conditions. He underlined that there is no contradiction between a diversity of unions and confederations and unity in the class struggle. Omar Shahadeh, conveyed greetings of secretary general of the PFLP Ahmad Saadat and his deputy Ahmad Fuad. He underlined their full support to the New Unions and the establishment of the new confederation will form a concrete step towards bringing the trade union movement in Palestine back on the right track and to reinforce the international solidarity with the palestinian people and working class. Thomas from the Norwegian ‘Workers Mate’ association addressed the congress reiterating their support for the New Unions and promised the Workers Mate will continue support the struggle of the Palestinian people through boycott, divestment and sanctions campaigns, including building efforts to boycott the Israeli trade union confederation Histadrut, which historically and up to today has played a key role in supporting and facilitating Israeli policies of discrimination and ethnic cleansing of the PAlestinian people and occupation and colonisation of their land. 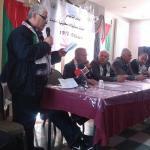 Adnan Dagher, a veteran unionist, reminded the congress of the long history of the Palestinian labour movement. He expressed confidence that the New Unions may recover the leading role of the workers struggle and trade unionism within the national movement and may revive the class struggle within Palestine. Muhammad Bleidi, the secretary general of the New Unions, in his closing remarks thanked everybody that has contributed to the establishment of the New Unions, all those that over the years have dedicated their time and struggle and energies in the long process. Muhammad Bleidi outlined the past and current work of the union to defend workers rights within the factories, at the Israeli workers gates and in the court systems. He reminded everybody of the mission of the union to defend and achieve labour and national rights for the Palestinian working class and its principles of unity, class consciousness and democracy and autonomy. At the end of the congress, the Palestine New Federation of Trade Unions elected their new Council comprised of 31 members and the new executive committee comprised of 17 members (four women). Muhammad Bleidi has been reconfirmed in the vote for the secretary general of the union. 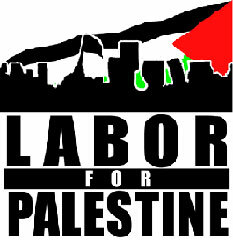 Labor for Palestine invites you to join us for the events below at Labor Notes in Chicago (descriptions from conference program) to build labor solidarity with the Palestinian-led Boycott, Divestment, and Sanctions (BDS) movement, examples of which include LFP campaigns, ILWU Local 10 members’ refusal to handle Israeli Zim Line cargo, and historic resolutions from UAW 2865, UE, and CT AFL-CIO. BDS demands an end to Israeli occupation and colonization of all Arab lands and dismantling the Wall; full equality for Arab-Palestinian citizens of Israel; and implementation of the right of Palestinian refugees to return. Please click here to RSVP your attendance, express interest, and share the Facebook event page. 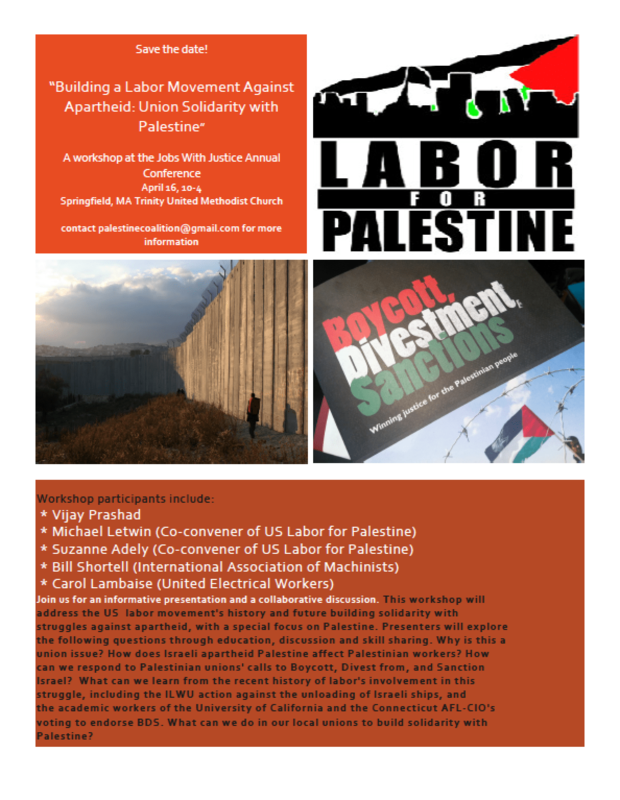 Whether or not you can attend, please also click here to donate to Labor for Palestine, which has been at the forefront of U.S. labor BDS since 2004 (see materials below). Join Manawel Abdel-Al of the Palestinian General Federation of Trade Unions (PGFTU)–directly from Occupied Palestine–as he shares the struggles of Palestinian workers and discusses the call by Palestinian civil society, including labor unions, for the use of Boycott, Divestment and Sanctions (BDS) as a strategy to win full equality, to bring an end to the Israeli occupation and colonization of all Arab lands, and to uphold Palestinian national rights, including the Right to Return and the right of self-determination. Our host, the United Electrical Workers (UE), is proud to be the first national U.S. union to endorse BDS! The Boycott, Divestment and Sanctions group are working to stop the Israel’s military presence in Palestine. In mid-April the NYU Graduate School Organizing Committee will vote in a referendum on whether to participate in Boycott, Divestment and Sanctions against the state of Israel. The BDS movement is an international movement working to end Israel’s military occupation of Palestine. Within the GSOC, the movement will work primarily to stop funding international and Israeli companies that violate Palestine’s human and civil rights, stop further communication with these companies in the future and encourage NYU to close their Tel Aviv campus. NYU is the only private university whose graduate student union has considered joining BDS. David Klassen, a fourth year Ph.D. student at the Graduate School of Arts and Sciences, is hopeful that NYU will set a precedent for others to follow. “We’ll signal to other people that this is something that has momentum and we’ll see other universities other unions, other student groups take similar steps,” Klassen said. Klassen is one of the chief organizers of the referendum and stands on the GSOC caucus for BDS. “It is incumbent upon people, upon the world, to listen to people who are in situations of occupation and oppression and figure out what we can do to alleviate that situation and make sure that everyone’s human rights are respected,” Klassen said. GSOC obtained signatures from 10 percent of its members to hold the referendum and the GSOC assembly of stewards has planned a series of town hall discussion events, the second of which will take place on Wednesday, March 30. All groups and organizers within GSOC will be able to voice their opinions at these town halls before the vote in April. Communication steward of GSOC from the Academic Workers for a Democratic Union and Steinhardt student Anne Pasek said GSOC must allow the membership to democratically decide the will of our union, even if it means considering polarizing topics. “As the Assembly of Stewards, our priority is to ensure that this vote is as democratic as possible with as much opportunity for dialog, because we know that this is one of the more challenging topics to discuss today,” Pasek said. Samuel Zerin, a Ph.D. student in musicology and an organizer for GSOC Open Dialogue on Israel and Palestine said he was strongly against the referendum, citing BDS’ demonization of Israel, and the organization’s suppression of dialogue. “One of my many concerns about BDS is not simply that is demonizes Israel as an ‘apartheid’ and ‘colonial’ state, but that its activists use this rhetoric in such ambiguous and normalizing ways,” Zerin said. A version of this article appeared in the March 28 print edition. Email Olivia Roosat news@nyunews.com. The University of California Regents will discuss the newest draft of the Regents Statement of Principles Against Intolerance, released on Monday, March 14th, 2016. 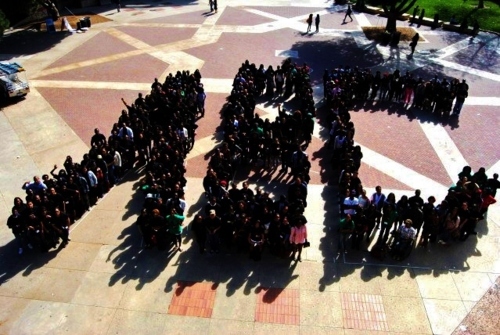 As a Black youth organization with constituents in the University of California system, the Afrikan Black Coalition supports Principles Against Intolerance that seek to protect students from hate speech and harm. However the “Contextual Statement” and the “Working Group Observations” are particularly concerning. The regental working group’s contextual statement reveals a continued attempt to silence criticism of the Israeli government and stifle Palestine solidarity activism by labeling it as anti-Semitism. We note that there have been attempts to get the UC Regents to adopt the controversial State Department Definition of Anti-Semitism, and enforce it with penalties including suspension or expulsion. This definition says any demonization, delegitimization, or double standard applied to the state of Israel is anti-Semitism. These terms are vague, and would themselves apply a double-standard to Israel, as no other country enjoys similar standards or special protections from criticism. Criticism of the Iranian or Saudi Arabian governments, for instance, is not necessarily Islamophobic. The University Regents thankfully did not adopt the State Department Definition, but the context of the Regents Statement of Principles Against Intolerance seems to align with the same political agenda; an issue of grave concern for all those who are concerned with justice and fairness. The Afrikan Black Coalition is in solidarity with Students for Justice in Palestine, United Auto Workers Local 2865, (UAW2865), Jewish Voice for Peace and hundreds of UC faculty in condemning the explicit conflation of anti-semitism and anti-Zionism that is included in the introduction to the proposed statement. Section C of the proposed Principles Against Intolerance states that “The Regents call on University leaders actively to challenge anti-Semitism and other forms of discrimination when and wherever they emerge within the University community.” We agree with this statement. As Black students who contend with hostile and anti-Black campus climate on a daily basis, we understand very clearly the need to eliminate bigotry from the UC system. However, by including anti-Zionism as a form of anti-Semitism in their contextual statement, the working group sets a dangerous precedent. Zionism is a political movement and ideology that must be subject to vigorous assessment and criticism just like all political movements and ideologies. We reject in the strongest terms possible the conflation of anti-Zionism with anti-Semitism. Such conflation can only arise from blatant historical ignorance about the origins of Zionism as a political ideology and movement. We recognize the specificity of calling out anti-Zionism as a craven attempt to chill constitutionally-protected speech and legitimate human rights activism.Zionism is a controversial nationalist political ideology that calls for the creation of an explicitly Jewish homeland in the biblical land of Israel. It is not the same as Judaism, which is the religion of the Jewish people. Just as Zionism and Judaism aren’t the same, neither are anti-Zionism and anti-Semitism. The improper conflation of these concepts is being pushed by off-campus political advocacy organizations in order to stifle criticism of the Israeli occupation of Palestinian lands and the unjust treatment of non-Jewish Israeli citizens and Palestinian refugees in the diaspora. It is clear that the state of Israel has been engaged in several atrocities against the Palestinians in violation of international law. These activities are documented by the United Nations and should always be subject to vigorous criticism just like any other nation. To conflate all criticisms of the state of Israel as automatically anti-Semitic is false and dangerous. To be clear, anti-Semitic rhetoric or action is not the same as or equivalent to pro-Palestine rhetoric or action. This sentiment is echoed and elaborated upon in a letter,signed by well over 200 UC faculty members, many of whom are themselves Jewish. In conversations with representatives from UAW2865, the UC Student Workers’ union, we have learned more about the Regents Statement of Principles Against Intolerance. An officer with the union spoke to UCOP Deputy General Counsel Julia Friedlander last Friday, at which point she said that there were “conflicting opinions” among University lawyers about whether the introduction to the statement was enforceable. The Regents have had many months to draft and evaluate this statement. The Regents still intend to vote in two days, even though their own lawyer admits they don’t know how this statement will be applied. Additionally, for a motion to address what constitutes Principles of Intolerance, the process has not been inclusive. A quick glance at the Statement of Principles Against Intolerance shows that the vast majority of the document focuses on bigotry facing Jewish students, with brief mention of the serious concerns of Black, Muslim, Latin@, and LGBTQ students. Further, other groups like students with disabilities are not explicitly mentioned in their opening statement, only in Section B of the principles. This clear rhetorical focus on the needs of Jewish students over other identity groups doesn’t reflect actual data on the campus climate concerns expressed by various student communities. The Regents would do well to remember that Black students face the highest levels of intolerance and disrespect as well as a hostile campus climate more than any other group on the University of California campuses, as verified by the UC’s own campus climate surveys several times. The experts chosen by the working group responsible for drafting this statement are more than questionable, with no women, Muslims, or experts on Palestine consulted. Experts on anti-blackness, LGBTQ hatred, or other forms of identity-based hatred were not interviewed either. Four “experts” were consulted by the working group drafting the statement, with two of them being open pro-Israel partisans. A third “expert” was Eugene Volokh, a conservative lawyer who was one of the main architects of Proposition 209, which ended affirmative action in California. For those who do not know, Prop 209 decimated the numbers of Black and Latin@ students on UC campuses, and none have recovered since. The inclusion of Volokh is a slap in the face to Black and Latin@ UC students and demonstrates that the Regents do not care about addressing structural racism plaguing the UC system. Volokh’s inclusion in this process is the kind of historic blunder that can only be explained as calculated cruelty towards and blatant disregard of Black students due to the role he played in systematically excluding Black students from the University of California. We find it unjustifiable that the UC regents made a conscious choice to include such a person to draft a statement of intolerance, something Black students endure the most of; partially as a result of our severe underrepresentation in the UC system. The irony is too thick. According to the 2014 Campus Climate Survey which garnered feedback from over 100,000 community members from across the UC system, Jewish students reported higher levels of comfort in classrooms and departments than students who identified with any other religious group. Muslim and Christian students reported significantly lower levels of comfort (pg. 58-59). According to the same survey, underrepresented minority students, LGBTQ students, and students with disabilities reported the highest levels of discomfort with campus climate. This is not to argue that Jewish students don’t face discrimination, nor to play oppression olympics. One only needs to look at the vicious rhetoric of Trump supporters to know that anti-Semitism and Islamophobia are alive and well, alongside other forms of identity-based hatred that must be condemned. That said, it is clear that other groups face just as much if not more discrimination within the UC system, but one would have no idea this was the case from reading the statement as currently written. This issue does not just affect the University of California system. What the UC does often set a precedent for other universities, and this is no different. The Afrikan Black Coalition does not support the Regents Statement of Principles Against Intolerance so long as it conflates anti-Semitism with anti-Zionism or Palestine solidarity activism. We oppose in the strongest terms possible the conflations of anti-Zionism with anti-Semitism.